From now on I'll be only doing occasional book reviews on children's books that I find tickle my fancy, have deep heart, diversity, and/or a roaring good story. As always I urge readers to support their local libraries and independent book stores. May you always find great reads for yourself. I grew up around chickens and turkeys as my grandfather had a poultry farm. Later my mom had chickens. Then, when I tried to raise bantams in my preschool, I found that to be a care taker of chickens is a constant vigilance. It was skunks, not coyotes, that became my downfall. I just couldn't make the chicken coop skunk-proof enough, having to go out in the wee hours to chase skunks away. No, I didn't get skunked as they just didn't like a wild, screeching woman with a broom chasing them in the indigo night!! For all that I respect chickens and all they give to us. A neighbor has chickens and I love the sound of the rooster crowing the morning awake. I love to obtain fresh, organic chicken and eggs as the taste is so like the chickens and eggs my Grammy cooked all those years ago. 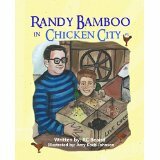 I think you'll like Randy Bamboo's equally brave enterprise with chickens in this book. Raising chickens isn’t what 8 year old Randy thought it would be, to just gather eggs and sell them. So, when he gets his first batch of chicks, Randy quickly learns that they also have to be fed and watered, not to mention the cleaning up of their droppings. On top of that there are coyotes in the neighborhood. Will he also have to give up his dog Fred? R. C. Beaird has set out an informative and amusing plot for his young readers accompanied by lively illustrations by Amy Koch Johnson. Increasingly, there are schools that include farming and some animal husbandry. This would be a wonderful book to help them to set up a unit with chickens that could easily include reading, math, art, music, and science. Likewise, a family with even a corner of their garden to share with chickens will have a grand time consulting this little tome. When their chickens lay eggs, they will discover the delicious taste of truly fresh eggs. In the last pages there are bonuses of lyrics to the “Chicken City” song and questions for further study and understanding. Mysteries are always a winner! I'm not doing as many book reviews these days because I'm busy writing and illustrating my own book(s), not to mention the least-loved chore of moving house to a place where the light is so gorgeous for my art that the aches and bother of the move are worth it! However, I couldn't resist reviewing this book as I love Sherlock Holmes, tales from other eras, and yes, I'm an Anglophile having lived in London for 12 years. Also, who wouldn't want to be an assistant to Sherlock Holmes? You can by solving a case with young Imogene in the pages of this new book for middle grade wannabe whodunnits. 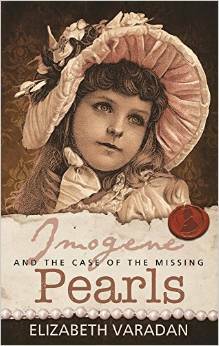 Imogene is a bright ten year old Victorian girl who dislikes piano lessons, hand-writing practice, and all the other arts that girls in the late Victorian era are expected to accomplish. She loves mysteries and avidly follows the cases of Sherlock Holmes in the newspapers. Her dreams of becoming a detective come true when Sherlock Holmes and Dr. Watson engage her as their assistant in solving the case of her mother’s missing pearls. Imogene keeps a diary of all her suspects, mostly household staff, especially her governess Miss Mullin who hides a secret in her sewing basket. She works hard at solving the mystery, but then she has to go visit her stuffy cousins in Staines for the weekend. How can she solve this mystery? Elizabeth Varaden has crafted an excellent plot that pulls the young reader deep into the story, has them identifying with Imogene, and then examining each page for clues as they read. It is satisfying to know that the genre of mystery books for young people has expanded, including historical mysteries. It gives children more books to choose from and the opportunity to fall in love with reading, which becomes a life-long passion for many. It is recommended that every home and school library have copies of this book for readers 9 years through high school.